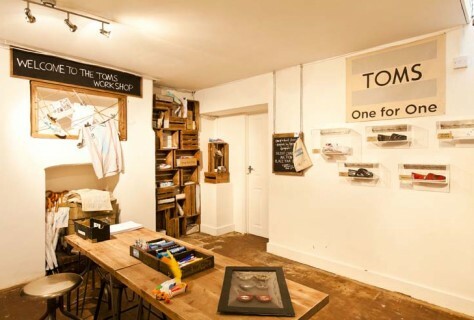 We were delighted to be invited to design and develop TOMS first UK standalone store. On entry to the store you can’t fail to be impressed by the eye-catching TOMS blue exterior complete with hanging flag sign and wooden one for one fascia. The window displays are simple yet effective and offer a snapshot of the brand and what is to be expected inside the store. We designed and developed this store staying true to the brands heritage and ethos and the brands ‘one for one’ mission statement remains fundamental to the store. 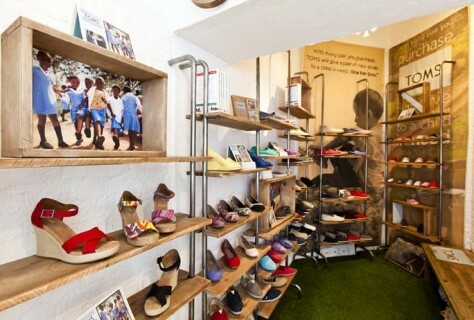 We created different areas in the store such as a footwear area made up of a bespoke shelving system which allowed storytelling, display and trying on. We added an astro turf floor to really set the area aside from the rest of the store. The eyewear area was made up of eye giving canvas imagery which provided the perfect backdrop to the new sunglasses on display whilst getting across the main message that sight in poorer countries would be aided with each purchase. Head downstairs and we have transformed the space into a creative hub for consumers to use as a workshop space. TOMS will have events and competitions running throughout the 2 months such as design you own origami TOMS, T Shirt design and a silent auction. The main feature is the acrylic boxes which neatly show case 7 unique glasses which have been especially designed by local designers. Overall this pop-up-shop provides a unique brand experience and manages to incorporate both product and storytelling through the creative and interactive space.